Talmud and Rabbinic Literature has been the focal point of classical yeshiva study, a tradition that we proudly continue. The debate and complexity of the Talmud serves as a model for a religious conversation which is multi-vocal, passionate, forward facing and simultaneously rooted in tradition. We learn Talmud with a critical eye, using academic perspectives and modern sensibilities to unpack its history, yet also with a deliberate awareness of how our interpretation can shape how these texts affect our lives. Below Shmuel Herr converses with a few of the students. Jason Rogoff teaches Halakha or Jewish Law at the Yeshiva He is pictured left during chavrutah study with students. In his class this Ellul his students are exploring the place of minhag or custom in determining Jewish Law throughout the centuries of psaq, from talmud, to geonim, through modern shutim. Night Seder is a time for students to learn independently in chavrutah (pairs) in a relaxed and intimate atmosphere. On Monday nights the Israeli students of Yeshivat Talpiot join Pardes students in learning related to the high holy day. Here Yeddidah Koren, of Yeshivat Talpiot opens an evening of learning for a packed room. Here an American Pardes Student and an Israeli student of Yeshivat Talpiot share a night of learning. Study should not exist in a vacuum. Responsibility to Israeli society in religious, political and social issues is a core value of Yeshivat Talpiot. 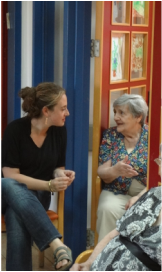 At the end of the first week, Yeshivat Talpiot students went to visit a nearby nursing home. Source sheets in hand, we learned with the seniors about the upcoming holiday of Sukkot, talked and sang.